In the mid-1950s, Buġibba was very different from the tourist trap that it has become. It was then a quiet summer resort with no commercial activity and no tourist industry. It was exclusively residential. 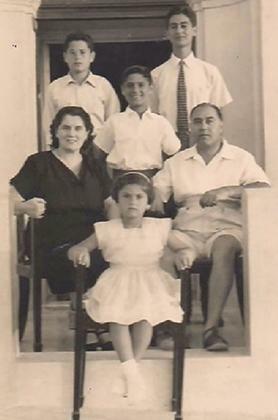 The author (centre) with his family at their summer residence in Buġibba in the summer of 1956. At that time, there was no building boom in Buġibba, and the current mania for demolishing houses and building flats had not yet gripped the Maltese psyche. In the mid-1950s, Buġibba was much smaller in size. It comprised Bognor Beach and Islet Promenade as well as several side streets that radiated from these two main roads. Beyond this residential enclave, it was all fields and open countryside. There were no retail shops, except for a small grocery at the corner of Bognor Beach and Islet Promenade. For everything else, you had to go to St Paul’s Bay. After all, this is what villeġġjatura seems to have meant in those days: having to do without all the conveniences. Every weekday afternoon, a bus arrived at Islet Promenade at 2pm and unloaded civil servants and office workers travelling all the way from Valletta in the summer heat. As soon as they reached their homes at this quiet and airy place by the sea, the civil servants and the office workers metamorphosed into shorts and sandals layabouts. Those who were not born yet at that time would find it hard to imagine Buġibba with no hotels, bars and restaurants. Vehicular traffic was very light, especially at night. In the summer of 1956, a few informal, small-scale dances to a four-piece band were held on Islet Promenade itself. If a car showed up on the street during the dance, the young people stopped dancing until the car passed slowly through. In that summer, it was pitch black at night at Buġibba, for electricity had not yet arrived there. Residents used lamps to light up their nights. But what magical nights they could be. On moonless nights, I would recline on a deckchair at our house’s front door terrace and gaze in awe at billions of stars which shone clearly and brightly in stereoscopic depth and definition. In the mid-1950s, Malta had no television. At Buġibba, when the sun went down, residents just lit a lamp and sat chatting outside their front door. By 11pm most people were in bed. Simpler times, simpler pastimes. The summer of 1956 was the last summer of my childhood. It was the year when one of my childhood dreams came true at last: that of spending the long summer holidays (lasting three months) in a house by the sea. Our house was on Islet Promenade. The exterior was rather plain but the interior had plenty of charm and character. The bedrooms on the second floor had balconies, and views of St Paul’s Islands. At the back of the house there was a garden with mature plum trees as well as a large patio with an old well at one end of it. The patio was shaded from one end to the other with a wooden trellis from which hung bunches of luscious, dark grapes in the late summer. My only chore that summer was to haul up buckets of water from the old well to water the garden. In the summer of 1956, I started the day at about 10am with a morning swim at the beach in front of our house. I returned home at 12.30pm for a hearty, quiet lunch with my mother and sister. It was at lunchtime, after the invigorating exercise in the sea and in the summer sun, that my sense of youthful well-being reached its peak. After lunch, I would relax at our front door terrace in the afternoon shade with a friend, chatting as boys do and reading comics until about 4pm, when we both headed to the beach for an afternoon swim. At other times, I enjoyed snorkelling, canoeing, fishing, walks with friends to isolated Qawra (then accessible from Buġibba only through a narrow dirt road), hikes to “far-off” Wardija with my brothers’ friends, and boat trips to St Paul’s Islands. During those idyllic summer days, school, exams and teachers seemed like distant memories. It was indeed a fun-filled, carefree summer to remember.